Charlton took full advantage of their second chance against Doncaster as goals from Dale Stephens and Simon Church gave them victory at The Valley. The original game in August was abandoned at half-time because of heavy rain, with Rovers leading 3-1. Stephens opened the scoring this time with a spectacular volley before Church slid home to seal the victory. The Addicks, who climb to 17th, also hit the woodwork twice while Doncaster failed to test home keeper Ben Alnwick. 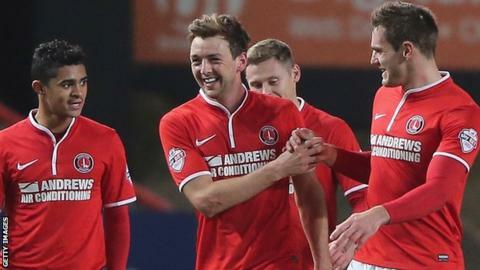 The win was only Charlton's second at home this season but they dominated throughout despite being forced into a late change. Goalkeeper Ben Hamer was injured in the warm-up, so Alnwick came in for what turned out to be a quiet debut. The home side's first chance came after just two minutes when Church should have given them the lead, before Yann Kermorgant scuffed a shot against the post. Johnnie Jackson then forced Ross Turnbull into a stunning save before the Doncaster keeper was finally beaten by Stephens. The visitors' only real chance fell to on-loan Manchester United striker Federico Macheda, who blazed a shot over the crossbar. Turnbull saved well from Lawrie Wilson but could do nothing when Church was sent clean through by Jackson and slid the ball home. Cameron Stewart went close to adding a third, striking the crossbar with a 25-yard shot. Doncaster slip to 20th as a result, but are five points clear of the relegation zone. Charlton manager Chris Powell said: "It was a deserved win, a brave, committed performance under some pressure. "We knew it was our game in hand and we all knew what happened in the abandoned game - so we needed to make the most of it. We didn't perform in that game but that was a watershed moment, if you pardon the pun." Doncaster boss Paul Dickov added: "We had six players missing from the abandoned game but take nothing away from Charlton, they looked half a yard sharper than us. "It grated at the time maybe but I can't let it go now. I'm not going to make excuses, we should have done better than we did. "We didn't match their desire and Charlton wanted it more than us." Match ends, Charlton Athletic 2, Doncaster Rovers 0. Second Half ends, Charlton Athletic 2, Doncaster Rovers 0. Foul by Alex Peterson (Doncaster Rovers). Andy Hughes (Charlton Athletic) wins a free kick in the defensive half. Offside, Charlton Athletic. Marvin Sordell tries a through ball, but Danny Green is caught offside. Substitution, Charlton Athletic. Danny Green replaces Cameron Stewart. Substitution, Charlton Athletic. Andy Hughes replaces Johnnie Jackson. Attempt missed. Federico Macheda (Doncaster Rovers) left footed shot from the left side of the box is too high. Assisted by Mark Duffy. Attempt saved. Theo Robinson (Doncaster Rovers) right footed shot from outside the box is saved in the bottom right corner. Assisted by Richard Wellens. Foul by Johnnie Jackson (Charlton Athletic). Hand ball by Reece Wabara (Doncaster Rovers). Substitution, Charlton Athletic. Marvin Sordell replaces Simon Church. Attempt blocked. Dale Stephens (Charlton Athletic) right footed shot from the centre of the box is blocked. Offside, Doncaster Rovers. Mark Duffy tries a through ball, but Alex Peterson is caught offside. Attempt missed. Mark Duffy (Doncaster Rovers) right footed shot from outside the box misses to the left from a direct free kick. Substitution, Doncaster Rovers. Alex Peterson replaces Marc. Johnnie Jackson (Charlton Athletic) is shown the yellow card for a bad foul. Richard Wellens (Doncaster Rovers) wins a free kick in the attacking half. Delay in match Bongani Khumalo (Doncaster Rovers) because of an injury. Foul by Federico Macheda (Doncaster Rovers). Rhoys Wiggins (Charlton Athletic) wins a free kick in the defensive half. Cameron Stewart (Charlton Athletic) hits the bar with a right footed shot from outside the box. Substitution, Doncaster Rovers. Theo Robinson replaces Billy Paynter. Corner, Charlton Athletic. Conceded by Ross Turnbull. Attempt saved. Cameron Stewart (Charlton Athletic) right footed shot from outside the box is saved in the top centre of the goal. Assisted by Rhoys Wiggins. Marc (Doncaster Rovers) wins a free kick on the right wing. Foul by Yann Kermorgant (Charlton Athletic). Attempt missed. Yann Kermorgant (Charlton Athletic) right footed shot from outside the box is too high. Assisted by Michael Morrison following a corner. Cameron Stewart (Charlton Athletic) wins a free kick on the right wing. Goal! Charlton Athletic 2, Doncaster Rovers 0. Simon Church (Charlton Athletic) right footed shot from outside the box to the bottom left corner. Assisted by Johnnie Jackson with a through ball. Attempt missed. Jordan Cousins (Charlton Athletic) right footed shot from outside the box is too high. Attempt saved. Lawrie Wilson (Charlton Athletic) right footed shot from the right side of the box is saved in the bottom right corner. Assisted by Cameron Stewart. Corner, Charlton Athletic. Conceded by James Coppinger. Attempt saved. Federico Macheda (Doncaster Rovers) header from the centre of the box is saved in the top centre of the goal. Assisted by Richard Wellens. Attempt blocked. Cameron Stewart (Charlton Athletic) right footed shot from outside the box is blocked. Assisted by Dale Stephens. Second Half begins Charlton Athletic 1, Doncaster Rovers 0.